Have you read Robert Thurman’s new book, Inner Revolution – Life, Liberty and the Pursuit of Real Happiness? From the subtitle, you'd expect to find a blend of Jeffersonian democracy and Buddhist psychological independence. Sort of the best of the West, and the best of the East. Good government from the West, healthy spirit from the East. The subtitle, taken directly from the United States Declaration of Independence, borrows a solemn ring of credibility from that hallowed political document. Little would you suspect that never once in the book's 322 pages would the Declaration of Independence be mentioned. Yet that is the case. Because strangely enough, Thurman has rejected democracy as the governmental system worthy to sustain human happiness, reserving that signal honor for theocracy. So what is this "revolution" of which Thurman speaks? It is an event that never occurred, called Buddha's Cool Revolution. This cool revolution, once imagined by Thurman, echoes throughout history. The original "shot heard round the world" was not fired from a cannon to announce the American Revolution, but rather was Buddha's realization of enlightenment some 2,500 years earlier. And while you may have thought that Michelangelo was the fire behind the Renaissance, you'll be pleased to learn that the true stimulus was the golden reign of dharma in Tibet under Je Tsong Khapa, a time so transcendent that the rest of the world experienced a sympathetic cultural flowering. These flights are not the excesses of Thurman's writing, but its basic substance. Rather than a cogent discussion of what Buddhism can add to the development of fair government, this book is a notebook filled with Thurman's piecemeal solutions for diverse social ills. Displaying no consistent political philosophy, Thurman encourages us, among other prescriptions, to provide generous government benefits to the Buddhist clergy, in exchange for which society will basically receive good vibes. This type of social calculus all works out in a place Thurman calls the "Buddhaverse." 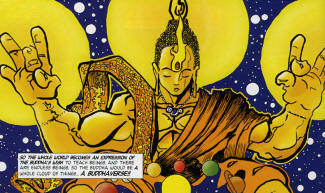 Thurman’s Buddhaverse, a contraction of Buddha and Universe, is a familiar place in the world of political philosophy. As far as I can tell, it fits the definition of a Utopia. In Merriam-Webster, utopia is defined as “1: an imaginary and indefinitely remote place, 2: a place of ideal perfection especially in laws, government, and social conditions, 3: an impractical scheme for social improvement.” Thurman’s Buddhaverse seems to qualify on all three counts. Like Thurman's Buddhaverse, too, the term "utopia" was invented -- Sir Thomas More joined the Greek words for “no” and “place,” (“ou” and “topos”) to create the contraction “no-place.” Further, both Thurman and More theorize morally coherent worlds that are intended to be "perfect." But More's Utopia is this in some sense tongue-in-cheek, while Thurman's Buddhaverse is dead serious. Because Inner Revolution is earnest political philosophy, Thurman tries hard to make his Buddhaverse sound practical and achievable. Inner Revolution thus invokes the language of commerce, describing Tibet’s monasteries as “enlightenment factories” that churned out armies of wise men, and projects the image of powerful take-charge Buddhas who “overpower obstacles” on their way to a better tomorrow for all beings. Buddha is a “cool-war general” who “sent out an army of monks and nuns to infiltrate all countries.” Thurman's Buddha is the pivot of history, whose magical abilities can be invoked to conquer any practical objection. Casting aside any suggestion that the Buddha might've been made of ordinary human clay, Thurman's Buddha has more outlandish characteristics than Paul Bunyan. According to Thurman, Buddha arose from the boundary between infinity and form to take reincarnation through magical apparition in the brilliant Tushita heaven. He took rebirth as a male in the royal family of the Indian Shakya nation on the planet earth in 563 BCE, in order to make an earthshaking demonstration of the vanity of mundane ways by abandoning his kingdom, wife, and child. Arriving in our earthly realm with the accumulated force of aeons of spiritual striving, the Buddha’s enlightenment drove a spiritual shock wave around the world that caused Zoroaster to revolutionize the Iranian religion, Deutero-Isaiah to codify the five books of Moses, Socrates to teach young boys, Confucius to write the I Ching, Lao Tzu to refute Confucius, and India to seethe with creativity. This "cool revolution" gradually took over all existing Asian governments. If Thurman's Buddha is a spiritual general, his monks are soldiers in a war to liberate themselves from the obligation of working for a living. Buddha forced the issue by forbidding his monks from performing any service to society except for begging and sharing insights. The kings of Buddha's time, Thurman says, were wisely persuaded to accept the intrusion of a “vast, materially purposeless institution” in their country. Buddha thus used India's “economic surplus” to integrate monks into society. This was the beginning of what Thurman calls "an enlightenment movement." The newly-empowered monks flexed their muscle during the reign of King Ashoka, who "heated up the cool revolution” in 262 BCE, imposing edicts to compel observance of Buddhist rules. Completely inverting the meaning of the term "revolution," Thurman calls Ashoka's edicts a "top-down spiritual revolution." Such torturing of language allows Thurman to argue that, because Ashoka built monuments, made enlightenment a prominent ideal, and promoted vegetarianism, he was a revolutionary. The one does not follow from the other. Ashoka was a king, who enjoyed the kingly prerogative of oppressing his subjects with his enthusiasms; this is far from a revolutionary notion. Prior historical authors labeled Ashoka an opportunist who sought alliances with the Buddhist clergy for secular purposes, but Thurman assures the reader that Ashoka created a glorious civilization based on the transcendent value of the individual, and "universal democracy." History does not support these claims. Aside from "cool" rhetoric, Thurman's enthusiasm for Ashoka's governmental style has little to recommend it. In Thurman's history of Buddhism, we pass from Ashoka’s reign to 100 A.D. when “urgent adepts … mad with compassion and excruciatingly aware of the priceless opportunity of human life” demanded more from the Dharma – a quicker, more effective path. Thurman thus imagines a new phase in his invented social chronology of Buddhism. Having established the monastic class of non-workers to till the fields of spiritual insight, the enlightenment movement demanded “spiritual technology” to solve production problems that slowed the process of manufacturing Buddhas. The Buddha responded to the demand by releasing new methods, thus illustrating that essential spiritual principle -- the squeaky wheel gets the grease. Not surprisingly, this spiritual technology is in the form of magical ritual. The tantric siddhas received initiation from Buddha, who annointed them with healing elixirs of enlightened imagination, "propelling them out of the gross world of the senses and into a dreamlike, magical, extremely subtle realm where aeons are moments and universes are contained in atoms." Buddha also transmitted visualizations of a "sacred architectural plan" that provides the secret key to a mandalic reality so secure that adepts "perceive death as a luminous foundation rather than a lurking doom." With these new powers in their arsenal, Tibetan Buddhists were able to accelerate the process of liberating beings to a rate previously unheard of. In all fairness to Thurman, this is the official Tibetan explanation for why their version of Buddhism is best -- because it is packed with Vitamin "M" for Magic and Mystery. Thurman simply retells the one-size-fits-all philosophy of his monastic preceptors, and making use of the freedom of expression allowed by monastic tradition, coins some new metaphors of his own. Thus does a traditional scholar add to the fund of spiritual knowledge -- with metaphor! And what metaphors! In reliance on these technologies, unheard of since the days of Lobsang Rampa, Tibet hosted a spiritual industrial revolution that harnessed the Buddha's high tech wisdom in the ultimate laboratory of the enlightenment movement. Equipped with lamas capable of seeing through matter and discovering the nuclear energy of the mind, Tibet became the secret dynamo of spiritual history, turning the world toward Enlightenment. Direct application of lessons drawn from Tibet's political history is a little tricky, however, because Tibet's history is a little different from our own. It includes magical events. For example, Thurman tells the tale of Padmasambhava's mighty struggle with the "ego of the national deity of Tibet" that Thurman likens to the epic battle of “Godzilla vs. Mothra, with cinematic special effects.” Appearing as a giant eagle, Padma swallowed Tibet's “potent father deity” that had appeared as a ferocious dragon. Just as things were about to wrap up, Padma’s partner in the enlightenment project, King Trisong Deutsen, burst in on the epic battle while the dragon's tail still thrashed from Padma’s mouth. Trisong Deutsen's intrusion ruined the exorcism. Furious, Padma predicted that now the deities of Tibet couldn't be relied upon to support the doctrine and a terrible price would have to be paid. While interesting, this Tibetan political anecdote is not exactly comparable to the Cuban missile crisis, and Thurman's efforts to give current significance to this ancient tale provide an example of how unproductive this process can be. Then again, some might wish to adopt the method whereby Tibet trimmed its military budget by entrusting defense preparations to ancient mystical rites performed long ago by mythical beings. Thanks to Padmasambhava, many generations of Tibetans grew up inhabiting a “safe zone for Enlightenment,” generated by Padma’s installation of “a high altitude mandala of radiant spiritual energy that transformed the bloodthirsty savage deities of Tibet into servants of dharma.” Padma still lives in a hidden paradise somewhere in the jungles of Africa. Presumably, the lama/generals left in charge of the supernatural shield were unable to contact Padma when the Chinese invaded. Alas, another lesson to remember -- even the best technology is only as good as its tech support. On the other hand, since the Vajra Strategic Defense Initiative did last for centuries, and kept people feeling secure, it might be deemed a good deal. After all, safe within that magic tent of invincibility, Tibet intensified its “inner industrial revolution” by developing “industrial strength” monasteries where individuals could transform their world into a Buddhaverse. The entire people of Tibet felt protected while engaged in a sustained attempt to create a society that provided everything individuals needed to achieve inner enlightenment revolution. And what were Tibet's guiding political principles? What can we draw from their experience to guide our own search for government that will foster human enlightenment? Well, it certainly wasn't anything democratic. The Tibetan lamas created a "buddhocratic political system administered by enlightened heirarchs" born out of the “reincarnation institution.” In other words, the monks ruled the country through the tulku system, whereby old monks picked new monks from among the children of the realm, who in turn became old monks who picked new monks, etc., ad infinitum. For Thurman, this is perfect! What could be better than appointing leaders vested with both spiritual and temporal power to make all decisions? This is the apex of both good government and true religion. Extending the logic, Thurman cannot help but ordain that a fully functioning Buddhaverse must be ruled by an enlightened tulku. Thurman pinpoints 1642 as the date when Tibet achieved this goal, when a Mongol warlord designated the Fifth Dalai Lama as a fit object of supreme reverence, and compelled his vassals to make offerings to the new theocrat. Thurman reinterprets this act of military compulsion as a showing of popular support for the Fifth Dalai Lama; however, this belief that tyrants express the will of the people seems, by this point, endemic to Thurman's thinking. While the ascendancy of a god-being completes the logic of Thurman's Buddhaverse, it seems to have done little for Tibet. The subsequent histories of the Dalai Lamas appear to be a mix of monastic intrigue and foreign manipulation, concluding with the 13th Dalai Lama's frustration with his ministers and effective suicide ("conscious decision to die early"). Thus, if Tibet was Thurman's model Buddhaverse, it seems to have failed during testing. More than the reign of the Dalai Lamas, Thurman plays up the cultural era sponsored by Tsong Khapa, the Gelugpa saint that Thurman declares was "completely enlightened" and developed “a curriculum that anyone could follow to reach enlightenment.” Tsong Khapa's enlightenment was a planetary phenomenon, a “spiritual pulsar” emitting enlightenment waves that likely caused the Western renaissance as a distant byproduct. During Tsong Khapa's heyday, everyone perceived Buddhas in the sky above, day after day, over entire regions and provinces. One-sixth of the Six Million Tibetans entered the huge monastic cities springing up around the country. The Tibetans felt they lived in a specially blessed and chosen land. The greatest problem with turning Tibet into a Lost Buddhaverse is the fact that it likely never was one. In our longing to imagine a Utopian realm of perfection, writers have often penned hymns to a removed, protected realm, guarded by benevolent mystic powers, where the fortunate are able to learn timeless truths in peace. By choosing the language of statecraft, commerce and industry, Thurman cloaks his endeavor with a modern, can-do appearance. But the substance of his philosophy owes more to the Lobsang Rampa school of Tibetology than he would like to admit. Like Rampa's, Thurman's lamas are thorough magicians, controllers of the elements, time, and the minds of men. The question, with regard to such lamas, is not whether they can, but whether they wish, to do magic. "We hold these Truths to be self-evident, that all Men are created equal, that they are endowed by their Creator with certain inalienable Rights, that among these are Life, Liberty and the Pursuit of Happiness -- That to secure these Rights, Governments are instituted among Men, deriving their just Powers from the Consent of the Governed...."
Unlike the Constitutional framers, Thurman places his faith in the intuitions and inspirations of the elite, the annointed, and the enlightened. He admires Ashoka, who compelled allegiance to an ideal creed, and the Mongol lord who made the Fifth Dalai Lama the ruler of Tibet. Thurman places no faith in the value of government based on the "consent of the governed," and thus his talk of democratic Buddhism is completely hollow. Inner Revolution provides only a nostalgic prescription to return to faith in special people and magical doctrines, and is marked by yearnings for supernatural solutions to concrete problems. The book fails to provide the up-to-date blending of spirit and politics promised by its title, and instead succeeds best as another pep rally to preserve the fading cultural heritage of Tibet.